It has been said that you can use any brand of battery in any metal detector. However, it is probably much more effective to use a good quality battery versus the cheap ones you get at the dollar store, which last longer and are more powerful than the imported specials. 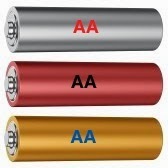 The good folks at published the results of their recent tests on AA batteries. The top three Alkaline batteries were the Duracell Quantum, Duracell Ultra Power and Kirkland Signature Alkaline (sold at Costco stores). Scoring slightly below that was the Duracell Coppertop and further below that was the Energizer Max and near the bottom was the Eveready Gold. Drug store brands like CVS Max, Walgreens Supercell and Toys R Us scored in the lower half of the test scale. Lithium batteries are the best but are not cheap and may not be worth the added expense over the long haul. In general batteries should be kept in a cool, dry place and contrary to what some people believe batteries should not be kept in the freezer. However you can store them in a refrigerator, but to prevent condensation you should keep in them a sealed plastic bag. You should not store them in a warm places as this will affect their life span. I've read where manufacturers suggest keeping the batteries in their original packaging if at all possible. I keep my old and newer batteries separated and do not mix them together. Most important is that If you are not going to use your detector for a month or more, you should remove the batteries and store them away until you are ready to head out hunting again.